Each month we publish our Catch-Up – containing our fish and seafood market report detailing each of the species and how their availability is looking for the month ahead. 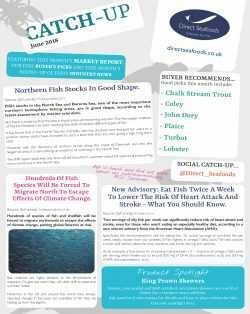 Also in the Catch-Up you will find an overview of the latest stories in the fish world which could be affecting the market. We also include our Buyers Pick highlighting which species are great for your menu’s this month. To get your copy of The Catch-Up, please subscribe to our mailing list by completing the form here.